This is the second stage of weekly meal planning. This occurs after grocery shopping (obviously) either the next day or same day, depending on your energy level. 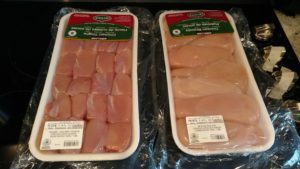 I start with Costco sized packages of both chicken breasts and thighs. This will be divided up, roughly, to yield 5 meals and a few mason jar salads worth. I have two slow cookers so I’ve done this in tandem. Assuming most people have only one, I’ll lay is out as such. The first part of the prep happens in the evening. Take two large freezer zip lock bags and place, in each, enough chicken to feed your family (in mine I put 3 chicken breasts and 2 thighs, total in each). In your slow cooker, place the remaining chicken (yes, this will be a LOT!). Add water or chicken broth, or a combination of both to cover the chicken. Place on low for 6-8 hrs and go to bed. Or quickly do your prep for the zip lock butter chicken for DAY 1. I’m doing a simple butter chicken dish. In each of the zip lock bags of chicken, add diced tomatoes, tomato sauce, garlic, curry paste, garam masala, onions, chicken broth, coconut milk. I don’t measure, just toss it in. Whatever recipe you choose, double it, one for each bag. Now you may go to bed! In the morning, you can either discard the liquid if you’re pressed for time, or strain, defat, and reserve as broth for another recipe. shred the chicken with a fork. Place all the chicken in a large container and let cool then store in fridge. We’ll come back to it later. 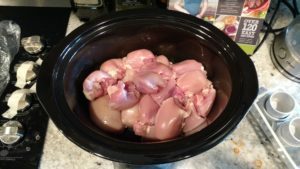 No need to clean out the slow cooker as we’re doing yet another chicken dish right away. Pull out those zip lock bags of chicken + ingredients we reserved. Throw one bag’s contents into the slow cooker. Depending on your timing, place on low for 6-8 hrs or high for 4-6 hrs. Label the other bag and toss in your slow cooker for a rainy day. All you’ll need to do is defrost overnight then toss in a slow cooker. Zero prep needed! 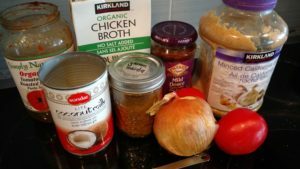 DAY 3: Healthy Spaghetti Squash Pad Thai: this recipe calls for cooked shredded chicken. The recipe takes a lot less time and effort when the chicken is pre-cooked. 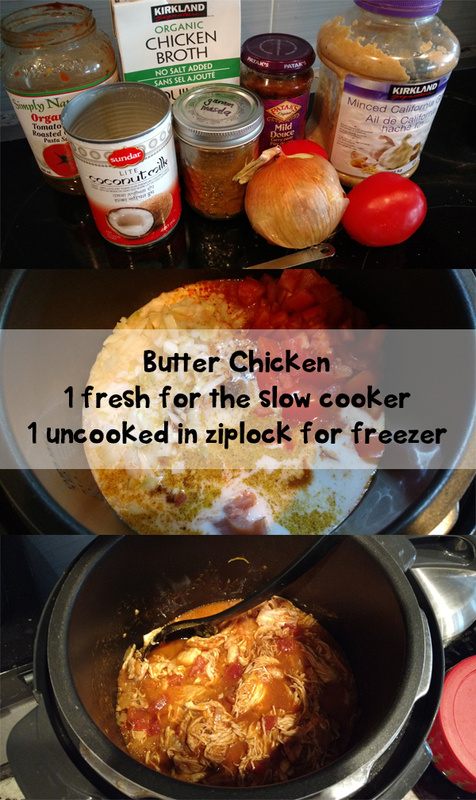 DAY 5: Chicken Enchiladas: this recipe will be doubled for a freezer meal that you can defrost and reheat quickly. It also requires cooked, shredded chicken. SALADS: We’ve got 5 mason jar salads planned for lunches for the week. Two of these require shredded chicken (2 for me, 2 for hubby = 4). Done! TODDLER: Plain shredded chicken is great to have on hand for toddler lunches.